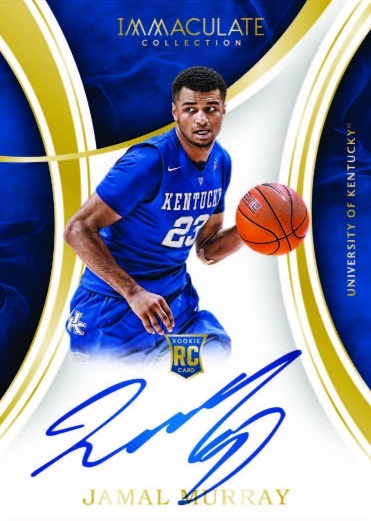 Continuing to mix their various licenses in one release, 2016-17 Panini Immaculate Collegiate Basketball consists of NBA players from their college days. Every box of the premium product totals five hits that can either be autographs or memorabilia cards. 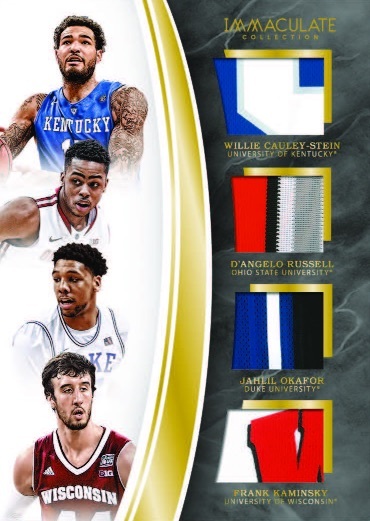 Averaging one per box, the 2016-17 Panini Immaculate Collegiate Basketball base set focuses on 40 of the elite NBA options shown during their amateur careers. There are also limited parallels for the base cards. Occupying the rest of the release are the hits and 2016-17 Panini Immaculate Collegiate Basketball has plenty. 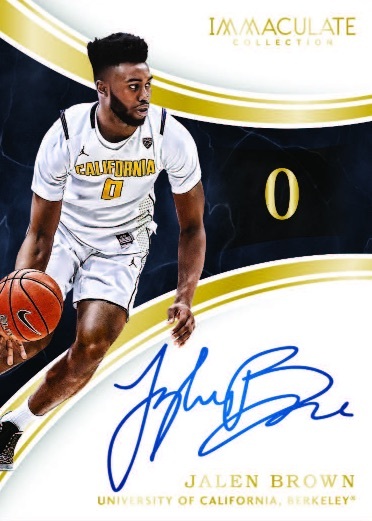 Rookie Autographs and Patch Autographs feature on-card signatures for top 2016 draftees while standard Autographs work with a horizontal design for the all-time college greats. Among the parallels are the one-of-one Platinum editions. 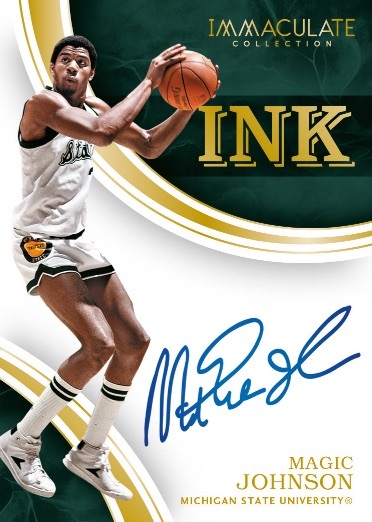 Other signed cards include Immaculate Ink with hard-signed cards from the NCAA superstars. 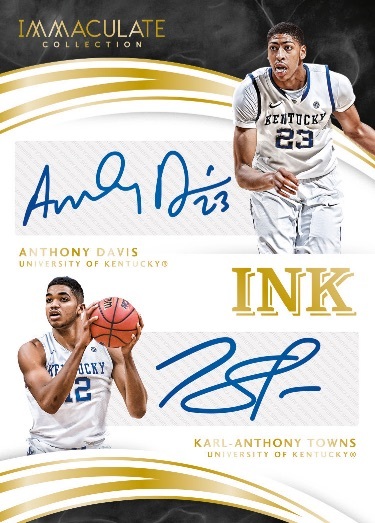 Doubling that up with twice the autographs are Immaculate Ink Combos which include pairings such as former Kentucky Wildcats stars Karl-Anthony Towns and Anthony Davis. 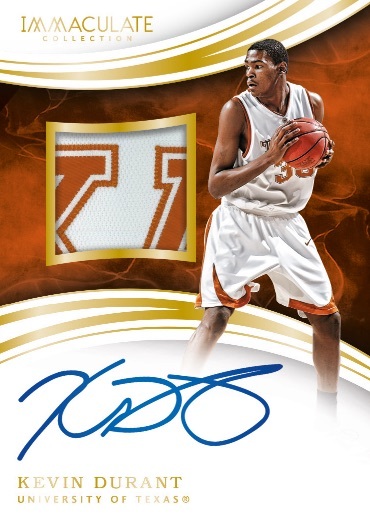 Immaculate Numbers Autographs are also signed on-card by 2016-17 NBA rookies with a design that references the player's college number. Lastly, memorabilia cards enter the mix for 2016-17 Panini Immaculate Collegiate Basketball with a few options. Immaculate Quads inserts take a four-player approach to relics with rare Brand Logo parallels limited to 1/1. There are also full-sized RPS Caps and Shoes relics as well as Sneak Peak sole relics. Sports Variations Autograph Memorabilia inserts bring multiple sports into the set with on-card autographs and relics from standouts in college basketball, baseball and football. Myles Turner Joe Young 2015-16 IMMACULATE ROOKIE DUAL AUTOGRAPHS RC AUTO 10 49! 2015-16 PANINI IMMACULATE SHADOWBOX ACETATE DENNIS SCHRODER AUTO 07 99!! 2015-16 PANINI IMMACULATE SHADOWBOX ACETATE DENNIS SCHRODER AUTO 04 99!! 2015-16 PANINI IMMACULATE GORAN DRAGIC AUTO 06 99! !